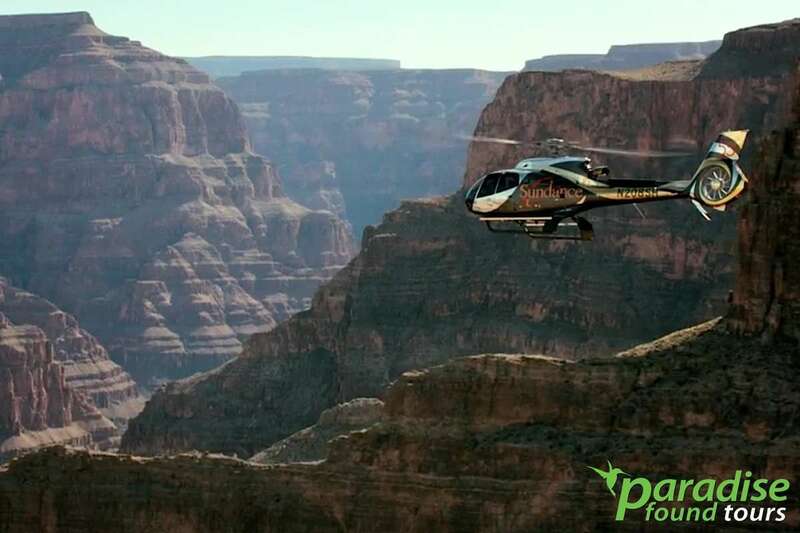 This is a one-of-a-kind Grand Canyon helicopter tour that flies you over all key parts of the Grand Canyon West Rim before treating you to a flight over the world-famous Las Vegas Skyline. This aerial adventure starts by taking off from the convenience of Las Vegas Boulevard, right across the way from Mandalay Bay Resort and only 10 minutes from all other major gaming properties. This package includes chauffeured stretch limousine service! Now that’s impressive, especially if you’re celebrating a big moment or you simply want the joys of pampered luxury. The deluxe helicopter locks into its cruising altitude just outside Las Vegas’ city limits before flying over Lake Mead, Fortification Hill, Grand Wash Cliffs, Hoover Dam, the Colorado River, the Canyon, the Grand Canyon Skywalk and the Mojave Desert before circling back to Vegas. On the return, the city comes into view and you’ll round Stratosphere Tower (1,148 feet tall!) before heading south, absorbing all that the world’s most famous skyline has to offer, including the Mirage volcano, Paris’ Eiffel Tower, Bellagio’s dancing fountains, MGM Grand’s Emerald City, Luxor’s pyramid and so much more. Back on the ground, you’ll rejoin your stretch limousine and luxuriate in a chauffeured ride back to your Las Vegas hotel. We think you’ll agree that this is an epic tour and we are confident that it will be the highlight of your Las Vegas vacation. Pick up by complimentary stretch limousine. Fly over Lake Mead, Hoover Dam, Grand Canyon, Las Vegas. We are now offering travelers FREE upgrade to a deluxe EC-130 aircraft. These helicopters are 23 percent larger than normal ones and are fitted with theater-style seats and a wraparound windshields. The upgrade is valued at $25 but it yours FREE. Tour Length: Flight from Las Vegas to the West Rim is 45 minutes with 35-to-40 minutes on the ground. When you return to Las Vegas, you will enjoy a 10 minute hover over the cityscape. Passengers exceeding 275 lbs. (125 kg/19 stone) will be required to purchase an extra seat. All passengers will be weighed at check-in. Children under age two fly free. These children must fly on the lap of a parent or guardian and must be safely secure in that position. If you child is older than 2, a regular priced ticket is required. Personal photography during the flight is permitted and at the pilot’s discretion. You must charter a flight if you are going to do commercial photography. Departs daily except on Thanksgiving Day or Christmas day. There are only 6 seats on a helicopter and the aircraft is configured in such a way as to make every seat the best one.Let us know if you’re celebrating a special occasion and we will do what we can to make your flight extra special.